To climb the highest mountain, jump from the highest airplane, ski the Alps. Sorry I got carried away. They just want me to help put out all these nutty wild fires in the west. So lets get going Blogville firefighters. I'll send Vaks even he don't have a fire fighter dress. But he got a lot of pee in him LOL. We are in! We hopes these fires go away soon and they gets lots and lots of rain. Hang on, let me drink up a little more, stock up the ol' firehose! We agree! A huge "Thank You" goes out to all the brave firefighters who are helping save our western lands (and lots of people's homes!). Wow, I totally agree! We all owe our thanks to the brave fighters. I think we should all drink a swimmie pool full of water and go help out. Great idea! Like dogs we got to really pee ~ like we each need to pee a lake. We pray for those brave men and women who fight those fires everyday. The amount of destruction so far is horrendous and the poor peeps and wild animals caught in it all. I am all for peeing on flames, but I don't have a cool fire fighter suit like you. Edward, I am on my way! I have been drinking a ton of water today so I have a lot of pee to help put out those fires! We got loads of water, wish I could send you sum to elp you out guys. Edward I love a man in uniform! I will send some kitty spit to help w the fires! What a great idea, Edward!! We will make sure to drink extra today! We are sending lots of POTP to those effected by the fires here in North Northern Cali and all over the west! All the boy doggies can pee on it! Yes, you are very brave! Great idea, Edward. Thanks to all those courageous firefighters who are working so hard. May they all be safe. Those fires are so scary! I wish they could get a grip on them! 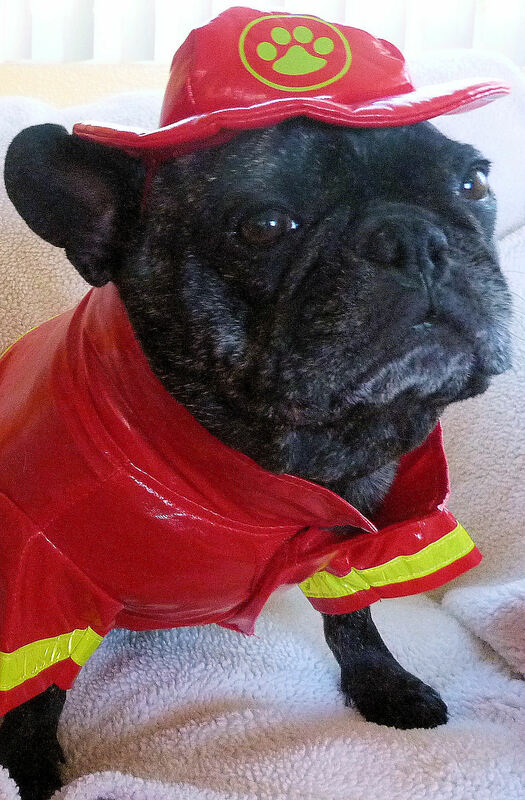 You make a very cute fire fighter. Lots of dog pee, some rain, a transformation of American dietary habits so livestock are no longer grazed on arid lands, reform of logging practices so old-growth forests are left intact, human population stabilization so climate change is kept in check--that should do the trick! Should be easy, right? Such adorable fire fighters. And such an important message. The fires out here are just horrible, and we're all so thankful for everything the teams are doing in order to fight back. Surely Blogville can provide loads of 'water'. Australia and New Zealand just sent over some firefighters to help. Those fires sound so fierce. You look smashing! Great message. Cammie loves to mark all over the neighborhood. She'll come with you! We are praying that they get the fires get under control! I drank lotsa pool water today so I can help out. We have our paws crossed that they get some rain and can knock down those fires. You are very brave to volunteer to help. We sure hope those wildfires will be out SOON! If you need him, we could ship Sam. When he pees, he ... well, he pees! You and all firefighters are very brave. I am crossing paws that it all ends soon. We hope these horrific fires end soon! You are so brave, Edward. Thank you! You and all the firefighters are doing a pawsome job helping control the fires. Good job!